After years of calls for Birmingham to appoint a ‘Creative Director’ — similar to Manchester’s Peter Saville, it seems the City Council have finally got the message. A source close the the cabinet revealed that they’ve even identified their man — Hollywood maverick Tim Burton. It may be that a replacement for regeneration chief Clive Dutton has been so hard to come by as officials have been shooting for the top and trawling the film world for someone with real vision, and big curly goth hair. With Dutton now working in that London it would be a coup for Birmingham to get such a creative talent to come in the opposite direction — it’s hoped that Burton would move to Brum from his current home in Notting Hill. Burton could be in place to oversea Birmingham’s year as UK City of Culture, and it would be expected to be coloured by his very particular view of the World. Plans to sell sponsorship on Council workers’ uniforms could be shelved and current hi-vis tabbards replaced with slightly down-at-heel Victorian formal dress, while the Birmingham Anchor and similar underground sites would be opened to the public. 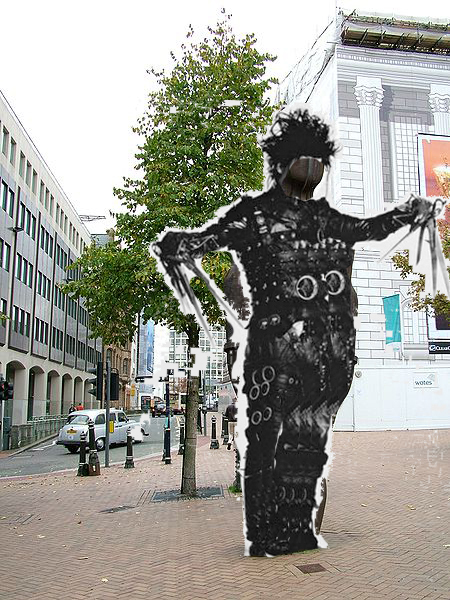 A creative director would also have power over public art, like Victoria Square’s overlooked Anthony Gormley Iron Man.